Free admission. Souvenir mugs cost $4, a taster is $1, $4 for a full serving. 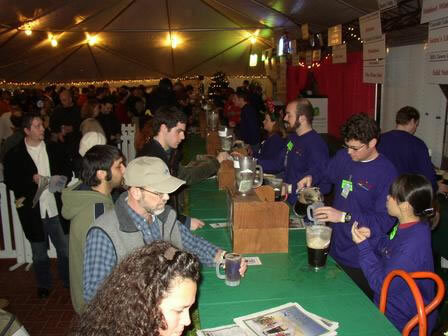 The Holiday Ale Fest combines the best and worst of the annual fests. Best beer, worst weather. Okay, both are subjective, but I loves me the dark, rich winter ales, and just have to rise above the grim barrier of gray drizzle to actually get to the beer. (The truth is, once you actually get from your car to the site, it's not bad--they've got heaters inside tents, keeping everything at a reasonable, dry temperature. But the beers are the real reason to go. Unlike other fests, where you're as likely to see a brewery's flagship as something new, the Holiday Ale Fest generally has a bounty of rare beers. 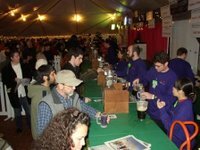 That's true this year, with specialty beers, international ales, and a fair sampling of one-time brews from brewpubs near and far. As a result, I have only tried fourteen of the 30 odd offerings, so there's going to be a fair amount of intuition here. A few breweries have sent their usual winter offerings, which, while good and tasty, are available everywhere. You might like one as a palate cleanser, but leave them to the out-of-towners. There are too many other interesting beers you may never see again. This is a relatively small group this year. As is their wont, Widmer is sending something unusual, a beer called Regifted Red described as a "NW Red." Large and hoppy isn't a dangerous guess. Hair of the Dog's Alan Sprints brewed up a beer in honor of beer pioneer Jim Kennedy called, not mystifyingly, Jim K. (Not an allusion to Kafka, methinks, but in the four-letter tradition of their named beers--Fred, Rose, Ruth, Greg, Adam, etc.) A version brewed for the Horse Brass celebration of Kennedy was described as a mixture of "Maredsous 8, a Belgian dubbel, with a blend of his own beers." The McMenamins are sending a tripel, which I'll probably avoid--their experiments in lagers and Belgians have historically fallen short. Walking Man's Homo Erectus gets two more ho's and even more hops and alcohol to become "double imperial IPA aged in Jamaican rum barrels." (Motto: "if you're having less than one, Ho Ho Homo Erectus is the less-than-one to have.") And finally, celebrating their five GABF medals (two silver, three gold--a "full house"), Pelican sends an imperial version of their Doryman's Dark called Full House. Among the great number of brewpubs sending beers are these that intrigue me: Klamath Basin Cabin Fever Stout (because I love stouts and haven't tried a beer from this brewery before), Ninkasi Brewing's Believer (because brewer Jamie Floyd long ago made a believer out of me), and Off the Rails Blizzard of Ozz (because I never even heard of this Forest Grove brewery). From way beyond Beervana come several international beers, among which three look pretty beguiling. First, Cuvée de Noël, from St. Feuillien, a historic brewery in Le Roeulx, Belgium. Made with herbs and spices, matured "long," and at 9% alcohol, I'd say this beer is worth a buck. Also from Belgium, Dubuisson's classic Scaldis. It is rightly one of the more famous beers in the world for its richness and complexity. I've had it a few times, and wouldn't miss sampling it on tap. Finally, the even more legendary Samiclaus ("Santa Claus"), which was, while in production from 1836 through nearly its demise in 2000, the world's strongest beer (at 14%). It was Switzerland's main claim to brewing fame, and was reknowned for its intensity. In 1997, the Hurlimann Brewery was closed, but Austria's Eggenberg Brewery bought the rights to the name, recipe, and even the original yeasts, and began production in 2000. It has now picked up an H--Samichlaus--but is still reportedly worth a try. I had the original, and now I'll try the clone. If you happen to go early and have something to report back, by all means do. I'll report my findings next week.